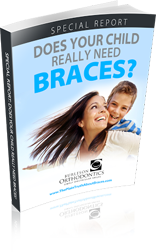 Your copy of the Special Report: “Does Your Child Really Need Braces? “ is on the way. Be sure to check your in-box. Congratulations and thank you! Your child may not even need braces. This report will help educate you on when your child should be seen by an orthodontist and give you more information about potential treatments.